Changes at the food pantry allow the Cheyenne Corps to help people even more. For Lts. Chad and Mistie Lamb, their ministry as Cheyenne (Wyoming) Corps Officers is all about not holding back–what God provides through the community is immediately placed in the hands of those people who need it. And God’s bounty is multiplying. Over the last year, the corps has changed the way it runs its food pantry. 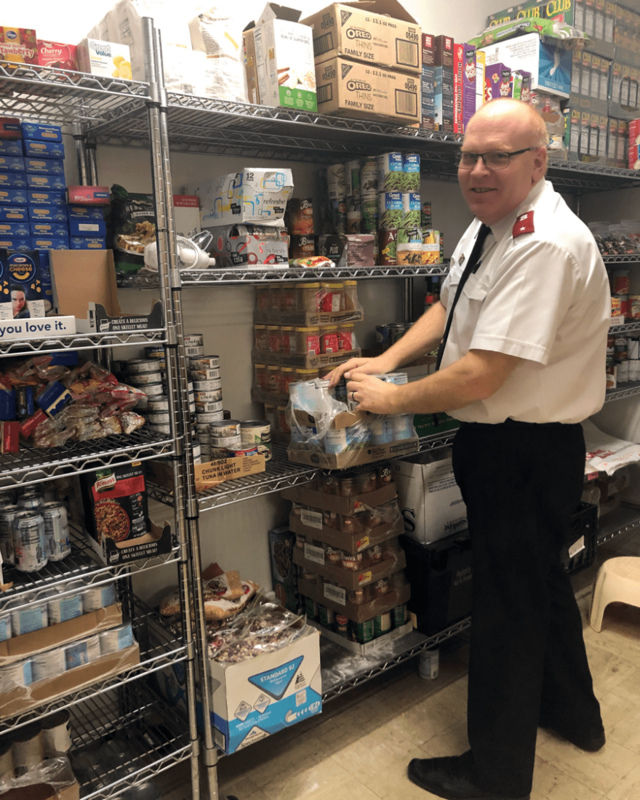 Recipients, volunteers and donors have all taken notice, and as a result, more donations are coming in, allowing The Salvation Army to more than triple the dollar value of food they give to people. The last census revealed 10.7 percent of the Cheyenne population is below the federal poverty line. Along with King Soopers and Albertsons, other local businesses are donating more food, which means The Salvation Army can give folks more food when they visit the food pantry. Clients used to receive a pre-filled bag of non-perishable food that they may or may not have actually wanted. Now people have a choice and can choose between corn or green beans, spaghetti noodles or rice, and so on, based on what they like to eat. “This allows for a larger sense of dignity for our clients, and it cuts down on waste since they are able to choose what they want,” Lamb said. People can “shop” at the pantry every 60 days and receive up to $146 worth of dry goods, meat and dairy items, a significant increase from the previous $44 worth of food. Clients appreciate the changes. Additionally, the pantry has moved from a serve-yourself system to a check-out system for the daily fresh items available, like fruit, vegetables, bread and pastries. “We used to see a mad rush at 9 a.m. when we opened, with a few people taking all of the items. Now we use more of a check-out system, where items are chosen, weighed and bagged, in more of a grocery store style,” Lamb said. “This way makes sure everyone gets something and you don’t have to worry about getting here first thing,” said an anonymous client. People can come as often as they need to for the perishable items that are donated daily to The Salvation Army. Lamb believes the supermarkets are donating more food because they see that it’s making a difference. “We have been very intentional in making sure that products that come in are quickly processed and put out for distribution,” she said. The Cheyenne Corps is also keeping an accurate account of the food moving through the pantry so they can better understand the need that exists and how they can best meet it. It’s not just local supermarkets that are being more generous. This past red kettle season the community was extremely benevolent, Lamb said. The Salvation Army’s staff, some of whom have been working for the Army in Cheyenne for five years or more, told the Lambs it was the most they’d seen donated in recent years. The Lambs are already planning for next season, reaching out to service organizations, schools, churches, first responders, banks and other community members to build their volunteer base. The Lambs believe God blesses those who give faithfully and trust in him. “Instead of storing food and items for ‘what if,’ we believe that God will provide all we need and more as long as we are blessing others as he intends,” Lamb said.